Soul of Brooklyn Week brings together and celebrates the best of the borough’s African Diasporan arts and culture while promoting partnerships between local arts organizations and black businesses in Brooklyn. Attracting over 20,000 attendees, Soul of Brooklyn Week features concerts, film screenings, plays, festivals, workshops, art activations and more! Click here to visit the official Soul of Brooklyn website. The Soul of Brooklyn launch will feature a performance by Seattle-based hip hop collective, Shabazz Palaces. There will also be performances by electro dub-hop group abstract random, and tunes by THEESatisfaction’s DJ Sassy Black and Stas THEEBoss. Join us as we celebrate the Soul of Brooklyn launch with live music, vendors, art activations, and more. Tap+Cork presents the 1st Annual Brooklyn Beer & Wine Fest. Featuring local, regional, and national beer and wine shops, the festival will also include live entertainment, food, and tastings! In partnership with the Central Brooklyn Jazz Consortium, join The Jeff King Band and the Brandon Sanders Trio for a live performance. 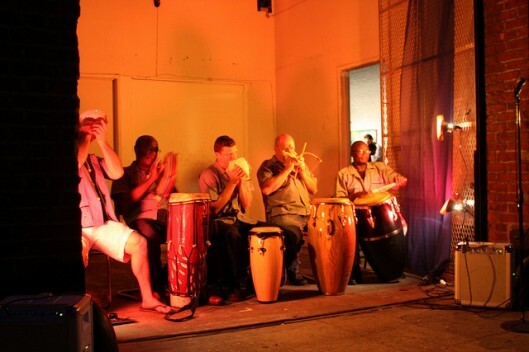 Meet us in Bed-Stuy, enjoy some live jazz, and sip local craft beers from Brooklyn. H Street is a comedic play that follows Frankie, the newest resident of the rapidly gentrifying H Street, any city, USA. Armed with a city grant to build a community center, she has dreams of building the perfect home for her new neighbors, but quickly discovers that it takes more than good intentions to unite a neighborhood. The play will be performed right on the outdoor stoop of Bill Lee, acclaimed musician and father of filmmaker Spike Lee. Presented by Jo-Na A. Williams, Esq. founder of J.A. Williams Law – The Artist Empowerment Firm, she will discuss the current trend towards entrepreneurship and the specific tools artists need to become masters at ruling their market and making money on their terms. Stay after the workshop for a meet-and-greet with the presenters, and enjoy cocktails, food and tunes by a local DJ. MoCADA’s new trunk show series kicks off with the latest collection from Nigerian-American designer, Busayo Olupona. Complimentary refreshments provided. I Don’t Camouflage and MoCADA present an event hosted by M1 of Dead Prez. Featuring music by DJ Mike Flo, the night will be a fusion of music, dancing, lights, patterns, and colors and a celebration of our individuality and uniqueness. Come wearing pattern prints! Come celebrate the 14th annual KidFlix Film Fest with a family-friendly films under the stars! This free film festival for kids and families is held every Friday night in August in Stuyvesant Heights’ Fulton Park. Black Weirdo is a party that calls for Blackness to be celebrated and appreciated in all facets on earth and beyond. Hosted by THEESatisfaction and bklyn boihood, the party will feature tunes by OC Note, Mursi Layne, and Chocolate Chuck. Artists Sam Vernon and Rushern Baker IV will lead middle school and high school aged students in creating abstract and landscape collage projects! 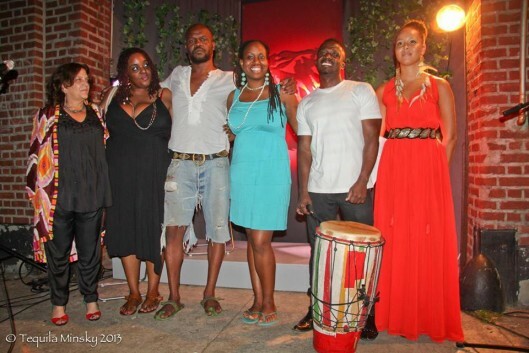 Haiti Cultural Exchange presents Kont ak Mizik Anba Tonèl: Ochan pou Mimi Barthélémy. Performers will share Haitian folktales and songs by the late Mimi Barthélémy, presented by Melissa Beauvery, Jennifer Celestin, Atibon Legba, Laura Simms, and music by Riva Nyri Precil. 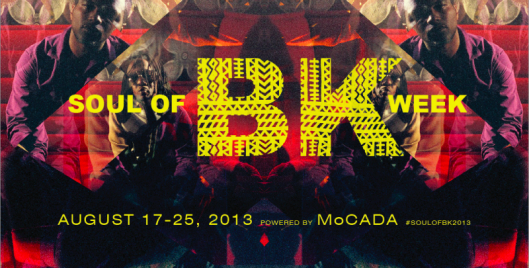 As part of this year’s AFROPUNK Festival, join us for the Soul of Brooklyn Week finale. The Block Party will feature DJs Rich Medina, Prince Paul, CX KIDTRONIK, and Mursi Layne. Check us for local Black owned business vendors of all types, art activations, and more! About Soul of Brooklyn: Soul of Brooklyn is a 32-member consortium of arts organizations with the mission of fostering collaboration between themselves and local businesses to bring arts programming to communities across Brooklyn. About MoCADA: The Museum of Contemporary African Diasporan Arts (MoCADA) uses the visual arts as a point of departure for exploring new artistic production across a variety of disciplines. Through exhibitions and programming, MoCADA incites dialogue on pressing social and political issues facing the African Diaspora, and fosters a dynamic space for the creation and continuous evolution of culture.